Before I dyed my hair I had already used hair serums but didn’t find the drastic difference as I do now. After I dyed my hair a few times, it lost the shine it once have, the ends are really dry, and it tangles really easily. 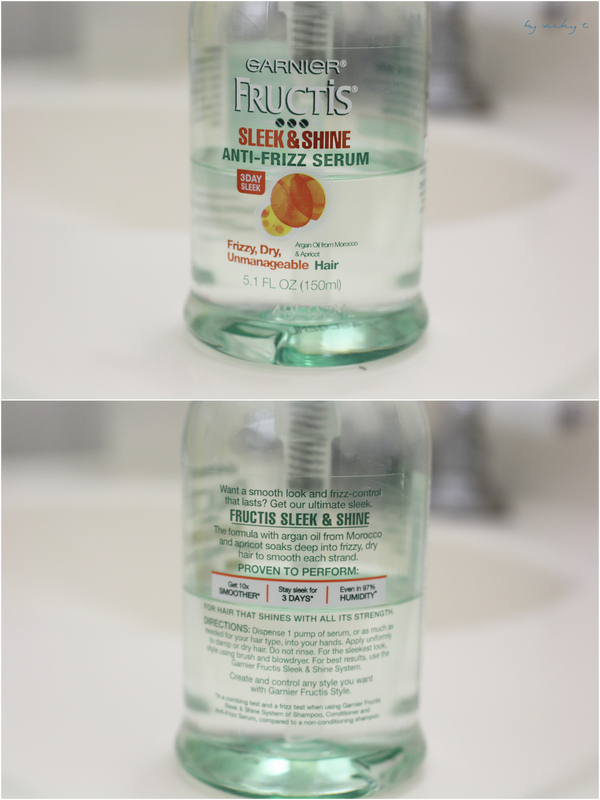 In addition to a lot of different hair products that I use to “save” my hair is the Garnier Fructis Sleek & Shine Anti-Frizz Serum. It claims it’s for frizzy, dry, unmanageable hair and it uses organ oil from morocco and apricot. Directions as written on the bottle: Dispense 1 pump of serum, or as much as needed for your hair type, into your hands. Apply uniformly to damp or dry hair. Do not rinse. For the sleekest look, style using brush and blowdryer. 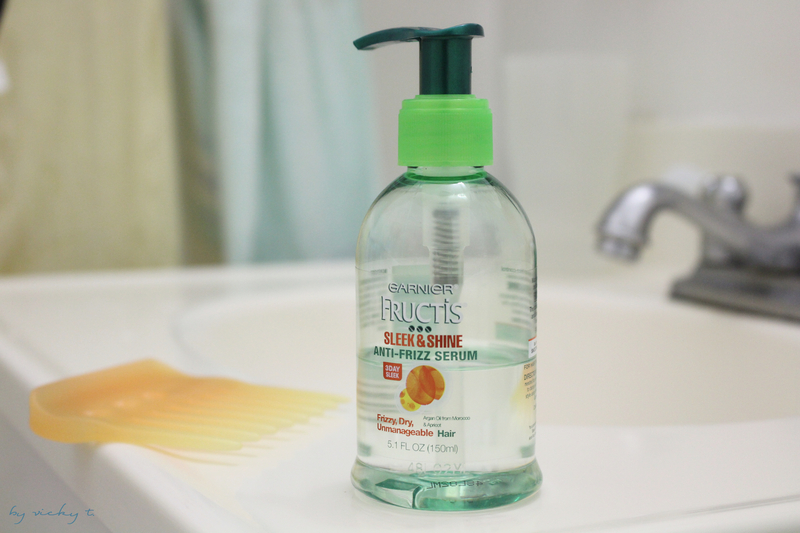 For best results, use the Garnier Fructis Sleek & Shine system. How I tend to use it is by applying it on the ends of my hair, after I shower, on damp hair and then blow dry. What I like about the hair serum is that it really does make it less frizzy and helps create a healthy (not oily) shine to hair. The hair dye really stripped my hair of that natural shine (I still want to keep dying my hair though haha). So, for the bad hair days in the morning, I apply a little after I straighten it as well to give it a bit of shine; a little bit of the hair serum is already enough so one bottle could last me a few months. The serum is also relatively cheap and could be purchased at local drugstores like target. What I don’t like about it though is the smell. The smell is really strong as is their other products. Though I detest the smell on this hair serum I’ve already finished 1 1/2 bottles. In addition, it only helps with the appearance of healthier hair and doesn’t really help much with the damages. This hair serum is my favorite so far but the smell in all the Garnier Fructis products really bother me. This product is great for anti-frizz and shine control but I think it’s about time I start looking for another hair serum to prep for possibly a lighter hair color. Anyone have any suggestions for damaged, and colored hair? But I was thinking of switching to OGX keke ❤ Will tell you how it works out! I also used this product!! My favorite too!! Haha you should try it. Ohh I love this product,same barand I’ve used for yeras I like their hair spray too. Oh I’ve never tried that before from this brand. Ohhhh I’ve heard of that, I’ll give it a try next time. Thank you for the suggestion!